SCREEN Completes New Manufacturing Facility for Semiconductor Production Equipment | SCREEN Holdings Co., Ltd.
SCREEN Graphic Solutions Co., Ltd.
SCREEN Finetech Solutions Co., Ltd.
SCREEN PE Solutions Co., Ltd.
SCREEN Advanced System Solutions Co., Ltd.
Kyoto, Japan – January 22, 2019 – SCREEN Holdings Co., Ltd. has finalized construction of S3 (S-Cube), its new manufacturing base specifically designed for semiconductor production equipment. Work on the facility has been continuing at the site of SCREEN’s existing Hikone Plant since January 1, 2018. In addition to specific devices such as personal computers and smartphones, semiconductors and electronic components have found increasing applications in a wide range of areas, including the automotive, finance, medical and public infrastructure industries. This has led to speculation the semiconductor industry may have finally escaped the boom and bust cycles it has been subject to every four years and entered a period of long term growth. Leading device makers have responded with high levels of capital investment and this trend is expected to continue for the foreseeable future. 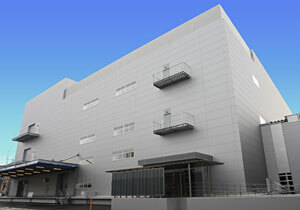 Based on its analysis of the market environment, SCREEN made the decision to construct its new S3 (S-Cube) facility. The development is one element in a manufacturing innovation project* it has been progressively implementing in order to improve the profitability of operations including its semiconductor equipment business. The factory incorporates an earthquake-resistant, base-isolated structure and is designed to enhance SCREEN’s business continuity management (BCM) and business continuity planning (BCP) systems. It is also equipped with a functional logistics system and large-scale automated storage and retrieval system. These technologies are expected to significantly increase manufacturing efficiency while reducing operator workloads and production lead times. SCREEN anticipates the construction of the new S3 (S-Cube) facility will expand its present manufacturing capacity by around 150%. The additional volume will enable the company to provide device makers with even more timely and reliable supply of equipment. This will help to strengthen the profitability and competitiveness of SCREEN’s semiconductor equipment business while allowing it to expand its market share as a supplier of production equipment. * This project is overseen by SCREEN Semiconductor Solutions Co., Ltd., the SCREEN Group company responsible for its semiconductor production equipment business. The project’s goals are to increase the profitability of this business by improving the efficiency of SCREEN’s distribution and assembly operations and enabling it to construct an industry-leading production system. Copyright © 2019 SCREEN Holdings Co., Ltd.